An acceptance speech is just a speech in small--a reduced version of the longer form. At least, that's what the audience is hoping when they watch shows like the Oscars. But because many actors fear and dislike extemporaneous speaking as much as anyone else does, many high-stakes award acceptance speeches fall flat, go on too long, or consist of just a long list of credits and thanks...a list that inevitably leaves someone special out. Colin Firth, nominated for best actor for "The King's Speech," has already promised a short speech, bless him. Open well. It might be funny, humble or touching, but just like a great speech or presentation, a short award acceptance needs to begin well to have impact. Say thank you to the awarding group. Awards don't fall from heaven. Make sure you thank the group bestowing honor upon you, first and foremost. Categorize, rather than specify. This is one time when it's best to thank "every single person whose heart and mind and work went into this wonderful film," rather than attempt a laundry list. Avoid the obvious. "There are too many people to thank," "I'm sure I'll forget someone," and similar time-buyers (time-wasters, in the audience's mind) just use up precious seconds. Rehearse. If you don't like speaking and there's a good chance you'll win, practice is your friend. Remember: Practice can help you deliver great words even when you're emotional and surprised, as many types of winners are. Specify something we won't hear elsewhere. Whether it's how you got started or what that teacher said that spurred you on, give us something specific about you and this award that will make us remember you and your speech. Briefly, please! Odumo Tari reminded "Everybody should be prepared. In case you're called, you already know what to say. Don't be caught off guard. Hannah Stewart said, "Just smile and say 'Thank you very much!'" Lahna LadiBug Bronston warned, "Keep it Classy!" Emily Culbertson offered "Two things: go ahead and prepare some notes, and concentrate your thanks on a very, very small number of people. Maybe 5 at the most? Thanking a lot of people is good for in-person audience, but your audience is really the however-many millions who watch at home. This is your chance to speak to millions of people, in your own words. What do you want them to know? If you want to inspire, to make people laugh, etc. tell a story, don't list a group of names." Five was a number that also worked for Deborah Barber Adams, who suggested "Come up with an acronym for the names of the five people you most need to thank. Lots easier to remember a word or a sentence than five individual names!" On Twitter, Jeff Levy added: "The same acceptance speech everyone should give every time: 'Thank you so much, I'm humbled by the honor. Good night.' 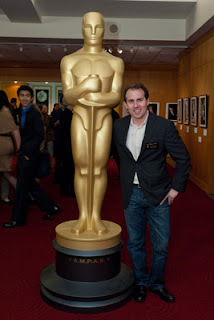 :)"
What's your advice--or wish list--for the Oscar winners tonight? Add to our list in the comments.